Over the years, the United States Mint has offered various special presentation sets in conjunction with commemorative coin programs. One of the most ambitious was the 2004 Lewis and Clark Coinage and Currency Set, which incorporated a multitude of items from the United States Mint, United States Postal Service, the National Archives and Records Administration, and the Bureau of Engraving the Printing. The Lewis and Clark Commemorative Coin Program was authorized to commemorate the bicentennial of the Lewis and Clark Expedition. The authorizing legislation required the issuance of up to 500,000 silver dollars with designs emblematic of the famous expedition. The coins would carry an obverse design depicting Captains Lewis and Clark on a stream bank, planning another day of exploration. The reverse would features two feathers representing the Native American cultures touched by the Corps of Discovery and a rendition of the Jefferson Peace Medal presented to important leaders during the expedition. Seventeen stars represented the number of states in the Union when the expedition began. 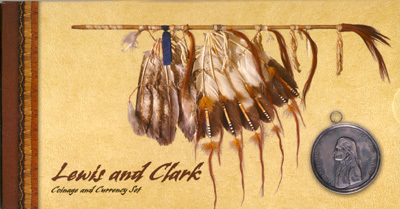 The Lewis and Clark Coinage and Currency Set went on sale May 12, 2004, the same day that individual coin sales also began. The product was limited to 50,000 sets and priced at $90. 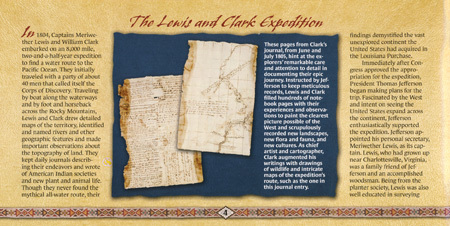 This product would include an array of coins, medals, stamps, documents, and a specimen note brought together to recall the story of the Lewis and Clark Expedition. The United States Mint coins included in the set were the two 2004 Jefferson Nickels issued under the Westward Journey series, with reverse designs featuring the Peace Medal and Keelboat, one 2004-D Sacagawea Dollar, and one uncirculated version of the 2004 Lewis and Clark Silver Dollar. Additionally, a silver plated bronze duplicate of the Jefferson Peace Medal was included. Three stamps were included from the United States Postal Service. These 37-cent stamps featuring Lewis and Clark were designed by Michael Deas and issued by the USPS on May 14, 2004. From the Bureau of Engraving and Printing, a replica Series 1901 $10 “Bison” United States Note was included in the set. The note included the portraits of Lewis and Clark to either side of an American Bison. The set was completed with two informational booklets written by archivists from the National Archives and Records Administration about the expedition and the Louisiana Purchase. Collectors responded to the Lewis and Clark Coinage and Currency Sets enthusiastically, with the US Mint reporting heavier than normal ordering activity on their website and at their telephone center. In order to provide the widest distribution possible, the US Mint announced that a limit of only ten sets per order would be imposed. Orders previously received in excess of the limit were adjusted. Within one week, the entire limited production of 50,000 sets was sold out. Interesting piece. Anyone know what these go for now retail? The greysheet lists a wholesale price of $40-44 bid/ask. Seems like a nice set for half the original issue price. I remember these. Beautiful sets. It’s disheartening that their market values have fallen so much. I suppose they were overpriced from the beginning. Wasn’t this commemorative also issued with a beaded pouch handmade by a First American? I recall some controversy about some of the sets being recalled as two of the participating “tribes” were not Federally recognized as such. Interesting commemorative. Kind of boring! I passed on this one, just not much excitement with this offering! They should have done something special with the Nickels and Sac. Dollar….maybe minted them in silver! Definately a weak offering!! Zaz- Yes, there was also a coin and pouch set, issued subsequent to this set. Several years after the fact the sets containing pouches from one particular tribe were recalled. I would be interested in buying these does anyone know where I can buy one.